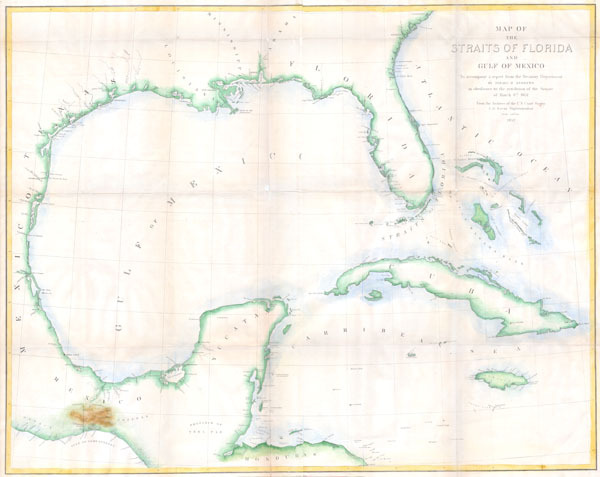 Map of the Straits of Florida and Gulf of Mexico. To accompany a report from the Treasury Department of Israel D. Andrews in obedience to the resolution of the Senate of March 8th, 1851. This is a rare large format coastal chart depicting the full coast of the Gulf of Mexico, Florida, the Bahamas, The Isthmus of Tehuantepec, Yucatan, Cuba and Jamaica. It was issued in 1852 to accompany Israel D. Andrews' report to the Senate. Depicts coastal cities and ports, offshore shoals, knolls, reefs, banks and other nautical hazards and some inland details, especially in the important overland crossing from Atlantic to Pacific of Tehuantepec, Mexico. Contemporary hand color. Andrews was the Consul of the United States for Canada and Trade and Commerce. Israel de Wolf Andrews was the Consul of the United States for Canada and New Brunswick from 1851 - 1854. Little else is known about this elusive figure. Very Good condition. Two joined sheets. Professionally cleaned, flattened, and backed with archival linen. Minor discolorations on original fold-lines. Blank on verso. Contemporary color. Wide margins.